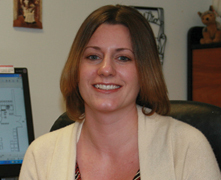 Christine first discovered her love for CADD while attending college at HCC in Harford County. She pursued her passion and received her CADD certification from Retts Institute of Technology, now known as TESST College in Baltimore, Maryland. She was immediately hired by Savoy-Brown Consultants. Christine has been working on the Savoy Brown Design Team since 2001. Her specialty is using the Archicad program to design layouts, rough-in drawings, and 3-D object making. She is very meticulous and strives to bring innovative ideas to the Savoy Brown design team.